2018 saw more rapid developments in the television industry. Pay TV continues to innovate at pace, shifting their spend from linear channels to on demand and other initiatives as they fight to grow. 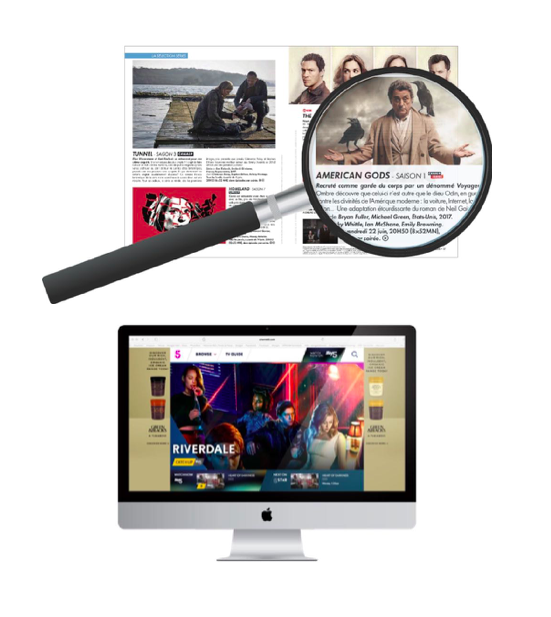 SVOD continues to grow and drive change in the content market whilst broadcasters respond by improving their offer for consumers (and advertisers) with in-season stacking, digital exclusives and box-set premieres to mention a few. Asia topped the rankings again and was the top pick for more respondents this year. Europe is the only other region with a year-on-year increase. The outlook for the African market is less positive than last year (dropping down from #2), perhaps reflecting discontent following the closure of Kwese’s DTH platform and the lack of any major competition in the anglophone market for DStv. The Middle East continues for all to be a market that is challenged by geo-political issues. 73% of respondents agree that SVOD will acquire more first windows in 2019. 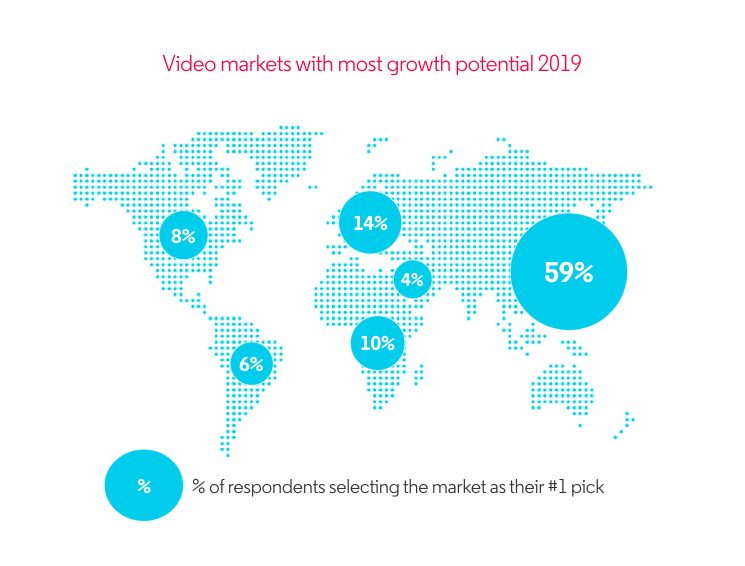 In addition to growing production activity, data from 11 key global markets shows that season-on-season SVOD is taking a greater share of first window acquisitions - with many individual territories finding the marketplace even more dominated by SVOD. In Sweden where SVOD has had huge success 80% of 2017/18 season shows went to SVOD in the first window. 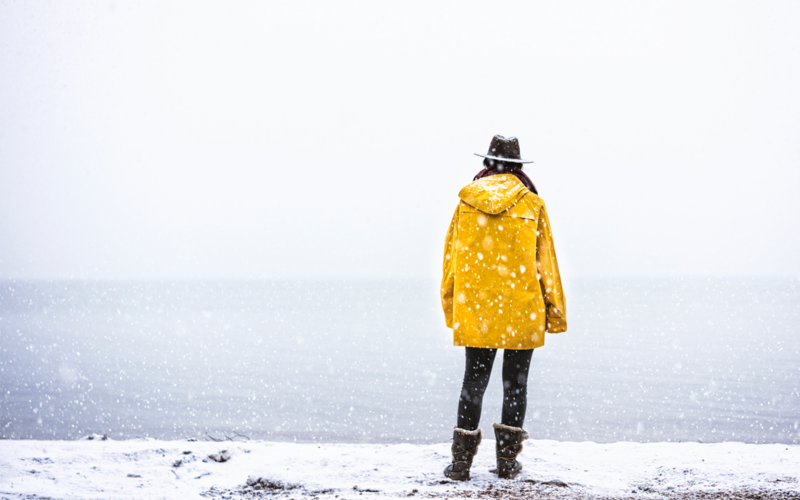 There is strong agreement from within the industry that broadcasters will have more enhanced content propositions in 2019. Perhaps mirroring Netflix’s recent launch on Movistar (Spain) and Sky (UK and Germany), and the increased activity by Amazon, the importance of SVOD to Pay TV subscribers was the leading issue for respondents. 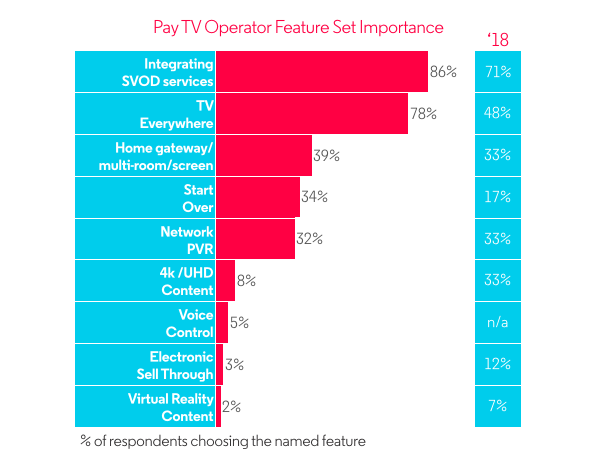 Fewer respondents rated the importance of 4K (perhaps reflecting the lack of content), and new innovations such as voice control and virtual reality remain a low priority. 2018 has seen great evolution with television businesses and the general feedback from respondents reflects that the industry does not expect this to slow down at all in 2019. With so many different levers to individual businesses the capacity for innovation and change is huge. SVOD is no longer marginal to anything or anyone, and increased competition (whether it be for subscribers, viewers or content) will continue to influence decisions by stakeholders along the value chain.